More than 65 volunteers from FIU, the Miami Heat and the Miccosukee Tribe of Indians of Florida came together Jan. 24 to help restore the Everglades. The Florida Everglades offers fresh water, flood control and recreational activities, but half of the original ecosystem has been developed into farms, homes and businesses. The annual Heat Glades Sweep event brings awareness to the importance of the ecosystem, the threats it faces and the need for restoration. 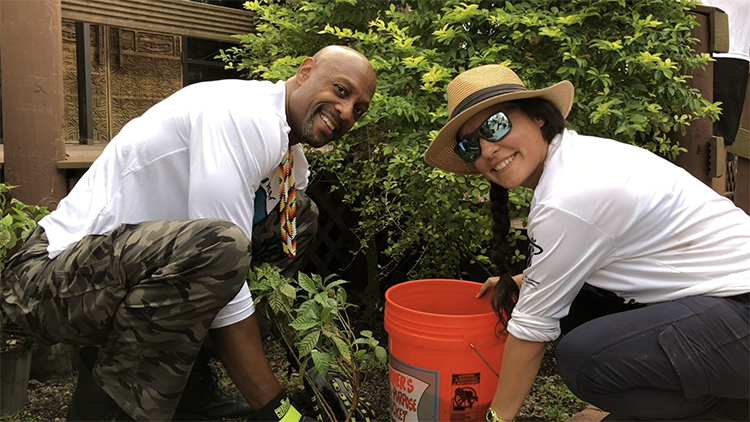 Miami Heat legend Alonzo Mourning and FIU alumna Erika Ashley Somoza help restore the Everglades at the 2018 Heat Glades Sweep volunteer event. The volunteers — including Heat players Josh Richardson, Bam Adebayo and Rodney McGruder as well as Heat legends Alonzo Mourning and Glen Rice — planted native plants for butterflies, bees and birds. They built an outdoor garden at the Miccosukee Indian School that serves as a living lab for STEM learning, as well as picnic tables that provide additional areas for outdoor learning. The volunteers also assisted the Miccosukee Fish & Wildlife Department in surveying invasive fish in canals. The information collected could help guide future conservation efforts. Monica Ospina ’14, environmental studies alumna and volunteer with FIU’s School of Environment, Arts and Society, led volunteers in planting native vegetation in drainage areas to keep them from getting blocked and to conserve water. Heat Glades Sweep is part of NBA Green efforts to generate environmental protection awareness and funds. In previous years, FIU and the Miami Heat have teamed up for projects throughout the county, including installing butterfly gardens at Biscayne Bay Campus, creating outdoor classrooms at Jesse J. McCrary Jr. Elementary in Hialeah, and building sea turtle nesting sites along Crandon Park Beach in Key Biscayne.